Silhouette Soft is a new, innovative non-surgical lunch time facelift performed by Taylor Clinic cosmetic doctors. Thread lifts are a non-surgical alternative to the traditional facelift. The procedure is performed by our Taylor Clinic doctors as an office procedure under local anaesthetic and requires no stitches or cutting of the skin. Which increases recovery time and reduces stress on the patient. Our thread lifting procedure in Sydney is a fantastic face lift option and patients can see a dramatic improvement in their appearance in under 1 hour. The thread is made from an organic polymer of lactic acid which is naturally found in your body. These thread lifts are perfect for sagging jowls, cheeks, necks and even drooping eyelids. And the procedure is long lasting, with results last for around 18 months after which this procedure can be repeated again. For a face lift that really makes a difference, there’s no procedure simpler than Silhouette Soft. Available from our Sydney clinic, we highly recommend this treatment to patients trying to recapture a youthful look. Thread lifting is an innovative procedure with minimal negative impacts on your skin and provides a great non-invasive option for those who are searching for innovative skin treatments. 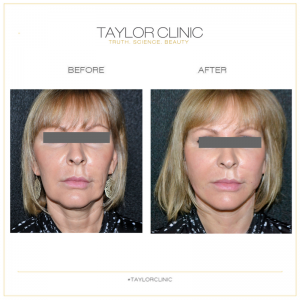 To start the process of your tread lifting treatment in Sydney, please make an appointment to see one of our Taylor Clinic cosmetic doctors who will assess a range of factors to see if this procedure is suitable for you. At your appointment, you can expect a complimentary comprehensive cosmetic face consultation. To make your facelift pain free, local anaesthetic is applied to the exit and entry points of the thread on the face and Nitrous Oxide (laughing gas) is available to ensure your absolute comfort throughout the procedure. Silhouette Soft can be combined with many of the treatments offered at Taylor Clinic and is commonly complimented particularly with anti -wrinkle injections, dermal fillers and ultherapy ultrasonic lifts. Please contact our friendly team on 1300 003 223 for more information or to book in your consultation; or click here to book online.